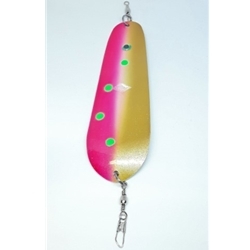 This specialty blade will add extra action to your lure due to its unique design. With its quality paint job each blade is inlaid with glitter that makes this trolling blade highly reflective in the water. The Lincoln Tail Feather Blade has a copper finishing on both sides. The Riddler and Wild Berry are both always wet on my boat. The Widow Maker and Watermelon were solid at Anderson Ranch last summer. Tickled Pink is hard to beat on the long line.